If koalas have any reputation at all, it's as quiet, cute marsupials that spend all their time eating eucalyptus. But male koalas unleash loud, deep yells that sound like the mating call of some massive beast. That's exactly the point. The males issue forth this deep bellow during mating season, which gave biologists a pretty big clue as to the basic reason why they were doing it - like pretty much any given situation in any given species, it's about attracting a mate. But just how the koalas make these remarkable noises, which can make them sound even bigger than bison and other creatures ten times their size, had been a mystery. 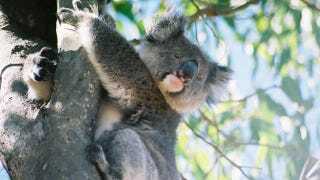 Researchers from the University of Vienna discovered that male koalas have a highly unusual voice box. Their larynx sits deep in the throat, descending all the way back to the third and fourth cervical vertebrae. What's more, the koala's larynx muscles are anchored deep in the thorax, allowing them to pull their larynx back still further to make even deeper sounds. There are very few other species that feature such a descended larynx - although we're actually probably the most famous example, as the placement of our larynx is crucial for our ability to form the complex sounds that make up language. Red deer also possess this unusual anatomical feature. Of course, koalas aren't using their deep larynx to speak...at least, not as far as we know. But it does allow males to develop highly unique calls that allow females to easily distinguish between potential mates. And, more generally, the descended larynx is crucial to the male's ability to create the deep, loud calls that make it sound way bigger than it actually is. That's a good way of intimidating other males, and it helps in attracting females too. This discovery could also be helpful in understanding the broader evolution of vocal communication, and the fact that this study extends our understanding to marsupials is exciting for biologists. As some of our most distant mammalian relatives, marsupials can reveal some of the most fundamental and deeply conserved aspects of our evolution. It's another piece in the puzzle of understanding why human male voice boxes are 20% longer than those of women, which is why human voices vary so wildly between genders. To hear what a koala bellow sounds like, check out the video below. Journal of Experimental Biology via BBC News. Image by Cody Pope.